I’ve heard of Underoos, but didn’t really take much interest in them. For those that haven’t heard of them, it’s a childrens brand of underwear featuring a character from Star Wars (and other licences). 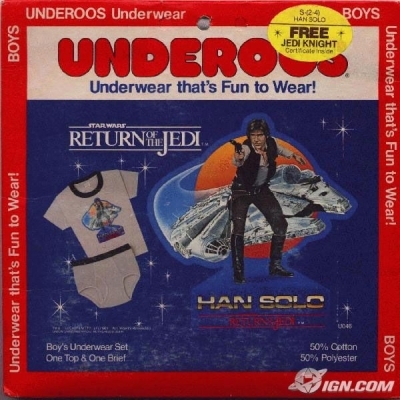 About the time of Return of the Jedi, Underoos released a Han Solo set that featured the Millennium Falcon. I’ve done a search and they seem pretty rare as i can’t see any for sale. This entry was posted in Things that i don't have yet..., Vintage. Bookmark the permalink.